I could call it “my secret weapon” to counteract usual over-indulgences. Back in June, I bought the book “The Dukan Diet” and tried that nutritional system for a while. I found out that I really like his oatmeal galette, a nice source of protein and complex carbs that became part of my weekday lunches. The galette can also be adapted for breakfast by omitting the salt, pepper and spices, and adding a little Splenda or the sweetener of your choice. Poach the chicken by bringing all ingredients to a gentle boil in a saucepan, cover the pan, turn the heat off, and allow the meat to sit in the liquid for 25 minutes. Remove from the pan, and keep in the fridge until needed (I usually cook 3 chicken breasts on the weekend, and save for lunches the following week). Make the pancake by beating the egg white in a small bowl. In another bowl, mix the yogurt with the oat bran, salt, pepper, and thyme. Add the beaten egg white to the yogurt, and mix gently with a silicone spatula. Spray a very light coating of olive oil on a non-stick frying pan, heat the pan over medium heat, and pour the pancake batter on it. Fry the first side until the top seems to be getting dry, then carefully flip the pancake over. Cook the second side for a couple of minutes, and slide the pancake on a plate. Cut the chicken breast in slices, add to the same pan you cooked the pancake, adding just a little more oil if necessary. Saute the chicken slices briefly just to warm them up and get some color. A squeeze of lemon juice at the end brightens up the flavor. 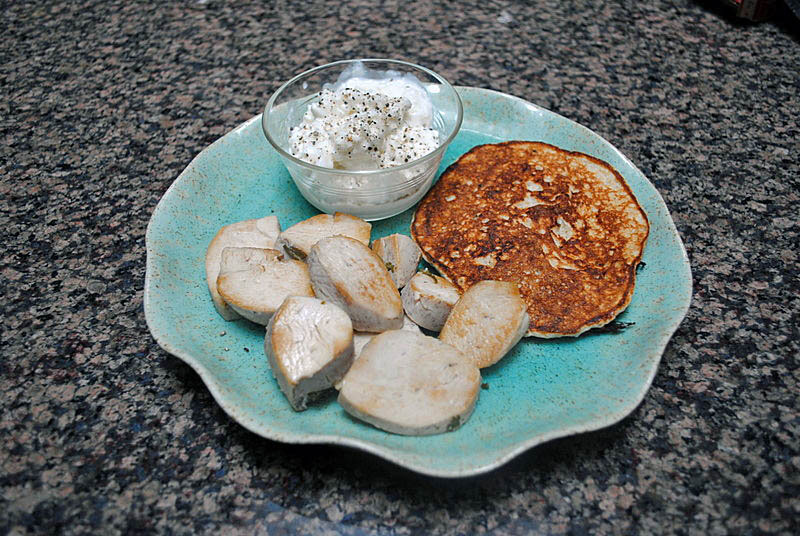 Serve it with the pancake and a small bowl of non-fat cottage cheese, seasoned with salt and pepper. Glad you asked! It turns out that the oat bran that Dukan calls for in his book, is not easy to find in the US. Here it is more common to find oatmeal, and some brands are closer to the “oat bran” than others. If you find oat bran where you live, just use it in exactly the same proportion. Superman, banana, superman… sorry this just made me think of your P90Xing it too. I’m going to try poaching chicken in green tea and soy sauce. I think the kids and I will really enjoy that. What a great protein lunch! 🙂 I’ve been on a hummus and pita kick lately, perhaps I can through a bit of this chicken in the mix. 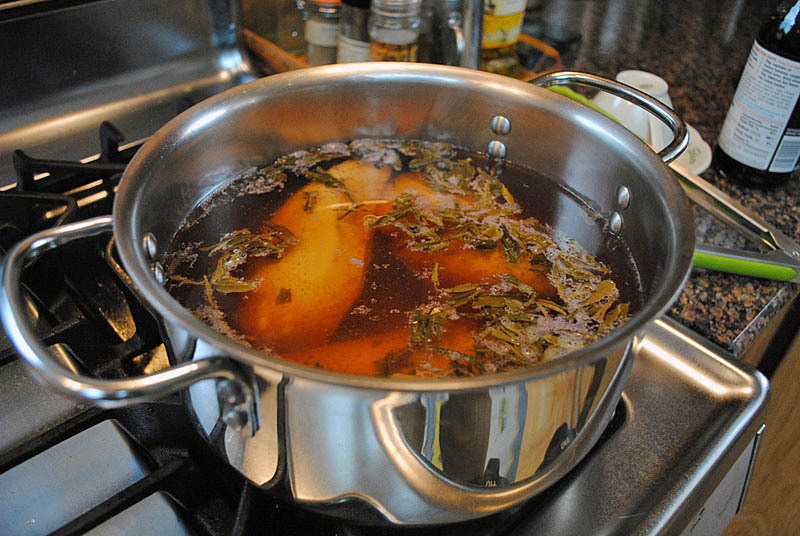 I love the idea of the tea in the poaching liquid! Super cool! I am having trouble to reply to each comment individually from my iPad (The Precioussss), so I address the last comments as a group. Well, seriously,now.. , I do eat a lot of veggies (but would be better with. more fruit, as Phil constantly reminds me) on my “regular” meals. Just whenI go for a real protein high I skip the veggies. Looks very good. I try not to eat any carbs beginning at lunch unless they are complex carbs – hate those simple sugars. I’ve heard of the Dukan diet but have never really looked into it before! You can’t go wrong with a high protein lunch, though! Looks delicious!